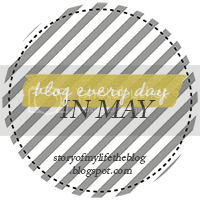 Today's Blog Every Day in May challenge is to share a favorite photo of yourself and tell why it's your favorite. Initially, I was trying to think of a picture of just me that I liked. Of course, that's a weird question to ask yourself. My mind immediately went to all of my NOT favorite pictures of myself - like my 4th grade school picture with my exceptionally crooked teeth or my freshman in high school picture where my yellow shirt combined with my huge hair makes me look like a lion. It was hard to think of a picture of myself that I really liked. But that was before I thought about pictures I liked of myself that had other people in them. Naturally, one of my all-time favorite pictures is with these two ladies - the infamous Reese and Sara. 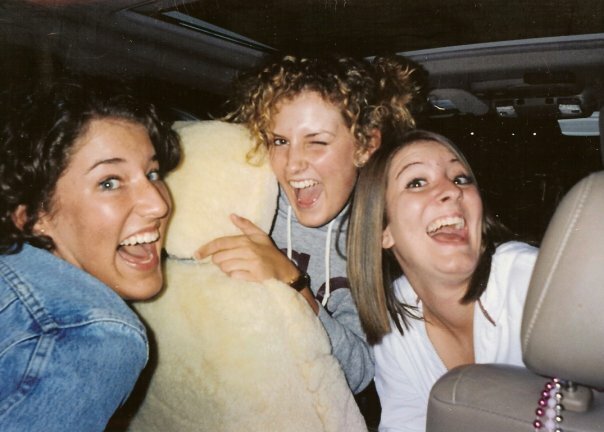 This was taken at the end of our junior year of high school in the parking lot of Starbucks. (Thanks, Jolie, for being the photographer.) I'm sure this photo was preceded by us listening to "In Da Club" or talking about what we would eat next or all of the above. When I look at this picture, I want to sweetly whisper, "In less than 10 years, two of you will have babies and two of you will go nuts and have to see a counselor. Have fun!" I would've loved to hear our discussion back then about deciding who would have what. I have no idea what prompted us to take this picture, but it is unanimously our favorite picture of the three of us. I'm so glad we captured the essence of our friendship and the freedom of the summer before senior year all in one photo.